It's Hip 2 Serve! 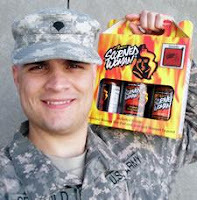 : FREE Sauce Gift Boxes for Military Abroad!! Operation Sauce Drop delivers great-tasting sauces to US military personnel stationed abroad, FREE of charge. This operation is run by The Carolina Sauce Company in order to thank our brave troops for their sacrifices. The Carolina Sauce Company has assembled seven different themed gift boxes of sauces, from mild and zesty to hot and fiery, from which any serviceman or servicewoman stationed at an APO or FPO address may choose. They will ship their choice of gift box to their APO or FPO address at absolutely no cost to them whatsoever. If you are a member of the US Armed Forces with an APO or FPO address or if you would like to sign up a member of the armed forces to receive a free sauce gift box at their APO or FPO address, you can sign up here. Simply select a gift box, fill in the shipping address, and submit your request by pressing the "order" button. What a great deal! !